A free space for conversation on the themes underpinning The Calm Photography Movement project and exhibition featuring Simon Jack (BBC Business Editor), Steve Wallington (TCPM co-founder and Creative Director), Poorna Bell (Executive Editor of HuffPost UK and author of Chase the Rainbow), Casey Moore (photographer) and James Scroggs (CALM’s Chair of Trustees). Recent UK figures show that men are three times more likely than women to take their own life, and less likely to talk to anyone about going through depression. 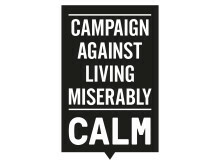 ​The Calm Photography Movement has been founded in partnership with LYNX to spark conversation about masculinity, mental health and self-expression through photography, in aid of the Campaign Against Living Miserably (CALM).